Todays post is a product review. 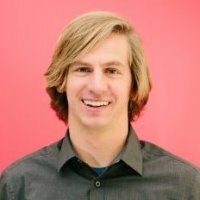 I provide unbiased product reviews in exchange for discounted products with the goal of helping people find good products and manufacturers improve what they create. My bike commute lately has taken a turn for the wetter. I moved to Seattle last fall and attempted to bike through what has been the rainiest winter on record. A typical day would look something like this. 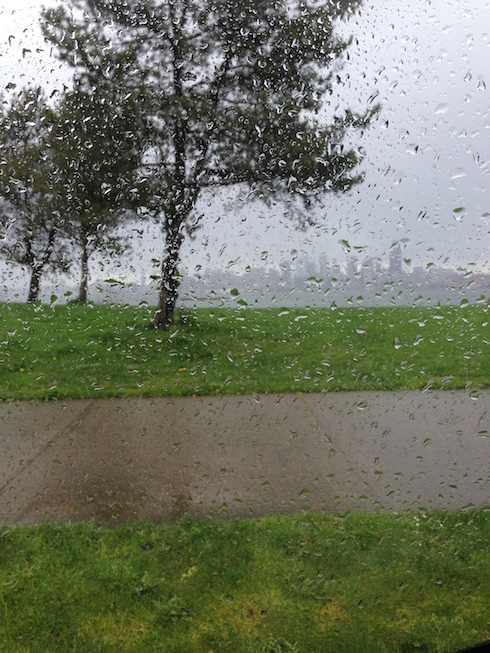 Lots of water on the ground, some big puddles and a steady trickle of Seattle’s famous light rain. During my commute, my backpack is usually stuffed with a laptop, smart phone, battery backup, cables and my change of dry clothes. Nothing I want to get wet. Even with a water resistant backpack and rain cover, I was always a bit worried and would quickly check when I got home. This is where the COR backpack comes in. 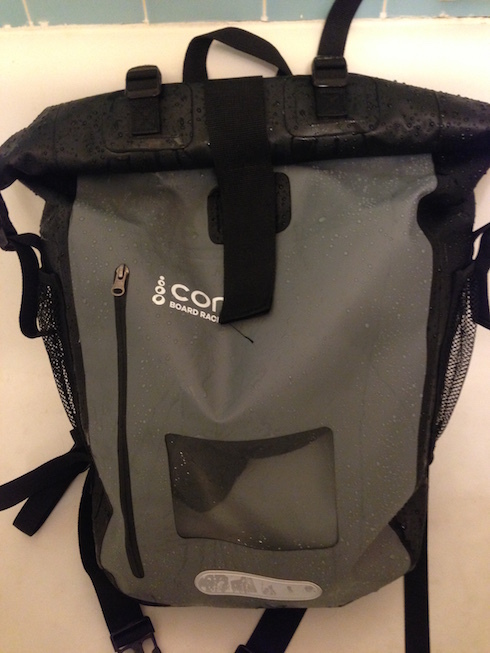 It is essentially a hybrid between a really sturdy dry bag, like the type I camping, and a biking backpack. Not a drop of water gets in. Here you can see a shot from after a bike ride home. It was thoroughly drenched. I tossed it in the tub to dry off, and grabbed what I needed out of it. I bike with confidence with my things in this bag. The bag has two pockets, both easy to use. The main section utilized a load-from-the-top method and has a really wide mouth so it is easy to shove in a change of clothes and pull them out later. The nice thing about this setup is it is easy to get things out when the bag is wet without them getting wet. By unrolling the top clipped area, I can pull everything out and keep it a safe distance from any water. The front zippered pocket is where I keep a few things I need quickly – my phone, keys, FOB to get into the bike parking area and wallet. Having those handy is nice and the clear pouch makes it easy to see what I’m grabbing. I assumed this would sacrifice in the comfort area but was pleasantly surprised. There are padded areas on the bag and the straps are adjustable so you can get a good fit. Thanks to cross-straps at the waist and chest, the bag stays in place while biking, which is critical. I’m really impressed by how well it rides. This bag just feels really high quality. From the stitching to the material, it all feels solid. The simplicity of the design also means fewer high-stress areas to worry about. The first thing I did when I got it was to seal it up with air inside, like a balloon, and then sit on it. I figured that was an easy way to detect leaks. No air came out and the bag didn’t show any signs of stress. No product is perfect. This one is pretty great though, but there were two things that stood out to me as needing improvement. The bag has two pockets, the front one with the clear plastic view and the large main pocket. In the large main pocket there is a divider designed to keep a laptop padded. Other than that and the water bottle mesh on the sides, there is nothing. In my current bag I have a place for everything, but in the COR bag, a lot of that just sits together in the main area. Not ideal for my setup. There are certainly workarounds, but I expect my every day bag to handle carrying and organizing that much stuff. I couldn’t get my 32oz Nalgene into it. It is just too thin. These days I expect an adjustable side pocket that will easily take a wide range of water bottles, this wasn’t up to par. I’m keeping it. This can’t quite be my every day bag right now, but it can be my bag for commuting on really rainy days. It will also be a good hiking bag for rain or canyons. I’ll also leverage it for surf trips or boat outings where I’m around water a lot – it will greatly reduce the risk of any electronics getting ruined and save me the extra step I usually take of putting a dry bag within a normal backpack. I am very happy with the bag and impressed by the construction. I think it can easily be an every day bag for many people and if my two complaints don’t affect you, I’d recommend you get it. Looks awesome. Thanks for the great review. Previous Previous post: How Are You Liking Seattle?